Just listed! The new Rainbow Collection. Now you can have something to match every outfit! 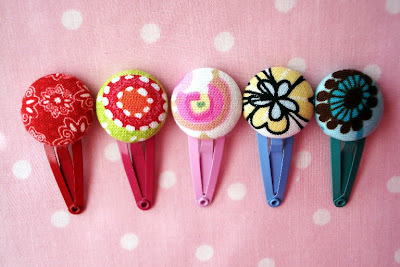 These are part of my mini clip collection and are perfect for babies or toddlers. I am continuing to list new hairclip sets so be sure to check in often. Also, COMING SOON...fun fabric headbands!! You'll want one in every color!! P.S. Congrats Moxylyn. You've got some kettle corn comin' your way. Thanks to Random.org for selecting my winner!! Oh my gosh, those are SO cute. I love them!! Those are very cute. If we have a baby girl, I'll be all over it. . . hopefully we'll get preggers soon. . . BTW - thanks for stopping by my blog and entering my contest. Good luck!